A few days ago, I visited the website of Uniformbooks, a small British publisher, and was bowled over to be confronted by a photographic memory from my past. What the picture shows is so obscure that I would never have expected to see it, and it had never occurred to me to look for it either. So far as I can tell from searching online, it’s a unique image of the subject. It may be the only such photograph that exists anywhere at all. The picture shows the final days of a tiny shop in the English town of Sutton in Surrey in the late 1970s. I attended a boys’ school in Sutton earlier in the decade and we often spent our lunch hours wandering around the area. Lens of Sutton—“Transport literature specialist”—in Carshalton Road was on the list of places to visit once in a while. The main shop was on the right and the lefthand side was used for storage. A colorful character in a black beret ran it. We assumed this gentleman to be “Len,” since that was what it said above the door, though I now learn from the Flickr pages of Lloyd Rich, who took the picture, that his name was John Smith. T. Len was the founder and proprietor until the late 1940s when Smith acquired the business. It wasn’t the magazines and books about buses and trains that intrigued me about Lens; it was the shop’s bizarrely precarious situation. What can’t be seen in the picture is that the row of dilapidated buildings is clinging by its fingertips to the edge of a pit owned by the local water company, which used it to deposit chalk produced by the water softening process. As another rare picture shows, the rickety pile of shack-like add-ons and extensions dropped down the edge of this crater below street level (Lens is at the top left). A classmate I contacted recalls a hatch in the shop floor that led down by steps or a ladder to a hidden lower room. 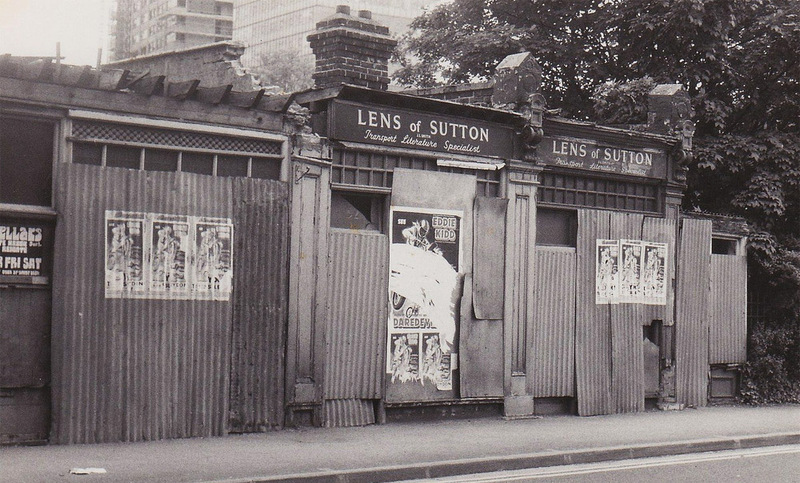 Lens of Sutton was demolished years ago along with the rest of the row. John Smith opened another shop nearby and died in 1999. The site is occupied today by a soulless B&Q DIY superstore with a garden center and a customer car park. Walking around its cavernous interior for the first time, after chancing upon the photograph, I felt the seeping melancholy that sometimes comes when a place from your past, which wasn’t necessarily of great importance to you then, has disappeared into the void of time, erased so completely from the world it might never have existed. Old photographs produce this effect even when the things they show have nothing to do with us—it’s the medium’s unique power. When the subject is familiar or personal, the photographic rediscovery of fading or lost moments can feel like a kind of homecoming.